RP: Actually I was just happy to see you. 12 Responses to RP: Actually I was just happy to see you. Gunmaster’s response is incomprehinsible as it is. Then there’s the gravity defying urine stream. That’s just poetic, is what that is. A spring loaded trigger that fires by crouching and slapping your legs. That is almost as good as mouse trap/cheese grader. Gunmaster’s sidekick’s name is Bullet? Frankie, his adventuring name is Bullet Boy (no lie), and his real name is Bob Tellub (again, no lie). That they would just spell “bullet” backwards for his last name tells you all you need to know about the cheese level at Charlton. Did they ever face Rex Topsed? Bullet Boy? And he doesn’t grow up to be Bullet Man? How disappointing. I was hoping he was called Bullet because Gunmaster shoots him in every issue. As a young boy in the early 60’s, Gunmaster was one of my favorite comics. It had an influence on me when I grew up and became a firearms accessory designer. 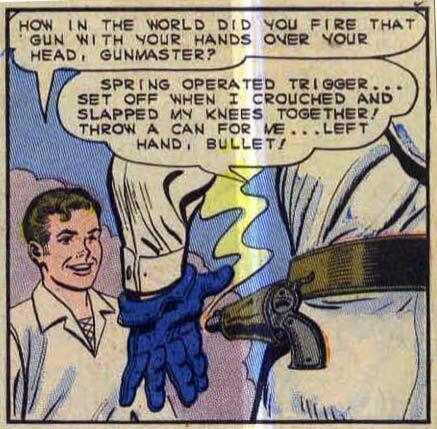 I know some of the things gunmaster did may sound outlandish to some, for example the above “A spring loaded trigger that fires by crouching and slapping your legs”. But they are at least possible and based in science. “Determined to protect Jesse, Milford decides to steal the cowboy’s clothes and impersonate him. At dawn, Milford rides into town where he confronts Jesse’s adversary, Snake. Having previously wired his pistols to his hat, Milford pretends to surrender, but upon raising his hands, lifts his hat, firing the guns and wounding Snake. Upon discovering Milford’s identity, the townspeople and Cora Lee are impressed by his bravery and gunslinging talents”. As a young boy I replicated that using my western hat and toy cap pistols. It worked. The lesson here is, unless you have tried something and know it to be impossible, (at least impossible for YOU to do), don’t discount it or think it can’t be done by someone else. I also remember an old western movie (I think Audie Murphy was in it) where the hero’s dying older brother had a spring loaded holster that would unhinge with the touch of a button allowing the hero’s older brother to outdraw all others. The older brother was murdered and the younger brother used his older brother’s holster rig to defeat the outlaws. Another unusual rig that was plausible, possible and based in science. I forgot to add this to my above comment. Here’s a video link to Bob Hope raising his hat to pivot and fire his revolvers. This is possible to do. I did it as a young boy using my cowboy hat and toy cap revolvers and holsters. Would you want to rely on it in a real gun fight? Of course not. But it is possible to do.